This June 29–July 4 reunion drew over 55,000 official attendees plus thousands more who descended upon a town of 4,000 during the scorching summer of 1913, with the promise of little more than a cot and two blankets, military fare, and the presence of countless adversaries from a horrific war. Most were revisiting a time and place in their personal history that involved acute physical and emotional trauma. Contrary to popular belief, veterans were not motivated to attend by a desire for reconciliation, nor did the Great Reunion produce a general sense of a reunified country. The reconciliation premise, advanced by several major speeches at the anniversary, lived in rhetoric more than fact. Recent scholarship effectively dismantles this “Reconciliation of 1913” mythos, finding instead that sectionalism and lingering hostilities largely prevailed among veterans and civilians. Flagel examines how individual veterans viewed the reunion, what motivated them to attend, how they acted and reacted once they arrived, and whether these survivors found what they were personally seeking. While politicians and the press characterized the veterans as relics of a national crusade, Flagel focuses on four men who come to the reunion for different and very individual reasons. 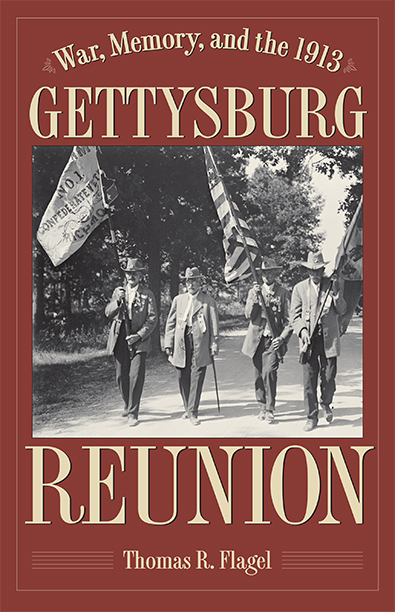 Flagel’s book adds significantly to Gettysburg literature and to Civil War historiography. AuthorThomas R. Flagel is associate professor of history at Columbia State Community College in Tennessee. The author of several books, Flagel has also worked with multiple historic preservation groups including the Civil War Trust and the National Park Service.